My municipal address has is #43. I have lived at this address since 1994. I moved to this address in my 37th year. So let me introduce the ’43’ problem that I found in a book called the The Arcana of Freemasonry. The Masons will help us build a temple. One for you and mi. Of course we will need to become acquainted with the ‘square and the compass’. It soon becomes clear that problem ’43’ is also a reference to the relationship between 3 and 4 and 5 and the right angle triangle. Is that why it is referred to as the builder’s glyph or mason square? 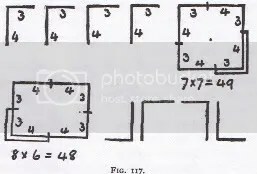 WHY does one building method produce a larger area even though both perimeters add up to 24. It helps to plot this puzzle on grid paper. Count the squares. ONE extra square if formed if we make a square? WHY does the rectangle produce ONE less square on the graph/grid paper? What can we conclude from this geometrical sleight of hand? An exploration of the above ‘riddle’ leads us to magic squares AND to an ancient solution that predates the Pythagorean Theorem known also as Euclid Proposition #47, found in China. Thus an understanding of Euclid Proposition #47 helps solve the riddle of why 48 and 49 differ by one? And more importantly why and how is ALL of this connected to DNA? How is an understanding of the number 43 connected to solving many of the riddles? Where ancient knowledge/alchemy/modern science all seem to converge/agree on a TRUTH, witnessed by accessing and recognizing the common denominators, that are evidence of an underlying TRUTH. What is the connection between DNA, the number 43 and the song by the Beatles? Total # of DNA codons used to make DNA codes? Another reason I am fond of ’43’? Our face has 43 muscles. And our faces are asymmetrical…just like DNA, matter/anti-matter and the 2 opposite facing/rotating swasitkas. Q. What are the basic human emotions? A. There are seven that have very clear facial signals:anger, sadness, fear, surprise, disgust, contempt and happiness. Q. Isn’t love a basic human emotion? emotions, though they are highly emotionally laden. And by conceptualizing it as 7 emotions NOT just 2, we are now back on track to using the light spectrum as a analogy. Our ‘primitive’ pre-literate ancestors before writing while knowledge was still being passed on using the oral traditions including folk stories, song, and dance etc., evidently exploited their ability to use asymmetrical facial expressions to help them communicate. Thus our asymmetrical faces, asymmetrical L/R hands, asymmetrical DNA all are evidence and together play a role in how the brain, L/R hands, the face, and communication are all intertwined, to get the job done. 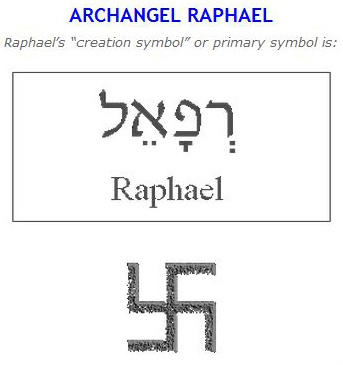 And by reverse engineering archetypal symbols I have come to the conclusion that the pair of opposite facing asymmetrical swastikas are fine symbols to represent all of the above. “In any right triangle, the sum of the squares of the two sides is equal to the square of the hypotenuse.” (the hypotenuse of a right triangle…which is the longest “leg”…or the 5 side of the 3:4:5:). The Right Triangle, below, shows the sides of 3, 4 and 5. The angle created between the 3 (side) and the 4 (side) is the Right angle of the square. A little later, when we begin to build it, (with sticks and string), you will place your sticks at the 3 corners of this Right triangle. The square of 3 is 9. The square of 4 is 16. The sum of 9 and 16 is 25. When we write down the square of the 1st four numbers (1, 4, 9 and 16), we see that by subtracting each square from the next one, we get 3, 5 and 7. These are the sacred numbers. I understand the 3:4:5 triangle but what if you change this to 5:12:13? The triangle isossceles, formed by two right triangles having sides of five, twelve, and thirteen units in length illustrating the 47th Problem of Euclid. What does 5:12:13 mean, instead of 3:4:5? Can we still use above theory? guess what they find in the safe at the end of the film. do not read, this is in a way a spoiler. a windmill, on two of its ARMS are the numbers 3 and 4.
difference is 49. which is 7 times 7.